Dress Materials Are So Famous!!! But Why? Salwar suits hold an important place in a woman’s wardrobe. Its elegance and charm has made it a popular wear all over the world. Salwar suit was worn by both men and women of Central Asian countries and then in time this outfit was worn by the people of Northern India. 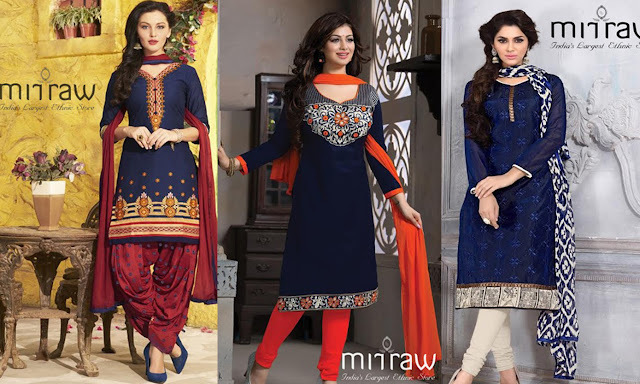 Slowly salwar suit became casual wear of every woman in India. The comfort and flexibility of the attire, won the hearts of women. There can be huge experimentation with an unstitched salwar suit, one can style it according to their aesthetic tastes. A dress material is an ideal choice if one wants to put their creativity and imagination to life. With the advancement of technology the perfect choice is to buy dress material online. Why choosing dress material over readymade suit is ideal option? While buying a dress material, one can customize it according to their body shape and tastes. A dress material gives room and liberty to style up as one wants. When one buys a plain dress material, one can add embellishments, motifs, and even dye the dress material into their favourite colour. By buying a dress material, one can bring out the fashion designer hidden in them. Dress materials is weaved in finest fabrics such as cotton, silk, jacquard, velvet, shimmer, satin, viscose, chiffon and many other innumerable materials based upon the occasion. From casual wear to high profile party wear, the weavers and designers of salwar suit style up dress materials as per the occasion. Customizing a dress material shows the artistic innovation of an individual. If the person loves to experiment with contrasting colors then one can mix and match the kameez or kurti with salwar suit. There are various options to customize the dress material. One can choose plain dress material and focus on adorning the dupatta with heavy embroidery border, mirror work on the dupatta, or with sequins and shimmer which will enhance the look of dupatta. Also one can show creativity in the cuts and styles of the dress. The neck designs, slit cut, sleeves of the kurti can be given a personal touch. Based upon the body shape one can hide the flaws and highlight their strengths. One can even customize the salwar according to their comfort. There are plenty of choices such as churidar pants, Patiala salwar, dhoti pants, palazzo pants, straight pants and many other styles which will complement the individual’s persona. While styling a dress material one must make sure the kurti and the salwar coordinate each other. Else the outfit might not radiate as expected. Purchasing unstitched salwar suit online offers many benefits. Online stores provide a wide range of latest dress materials with stylish and modish patterns, embellishments, and designs. Also few sites offer online services of tailoring the dress material without the need of stepping out of the home. One can customize the dress material and schedule a pickup of the dress material along with right measurements and within a stipulated time frame the desired dress material will be stitched and delivered to the home address, also the payment is done only after the outfit is delivered. The utmost aim of all the online sellers is to give comfortable experience to all their customers.